tapir: A try... Black has a sure eye at the circled point (because of the cut at a, a and b are miai), the white 1 selfatari secures at least one more black eye. illluck: Sorry, but it looks to me like a and b are not miai. 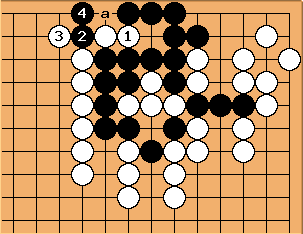 If white plays at b I can't really see how black could make the cut at a work. However, I think 1 is the solution as well. My idea is that black should play at b after white 1 to make a sure eye first. The four white stones are the other eye (snapback if white tries to escape). 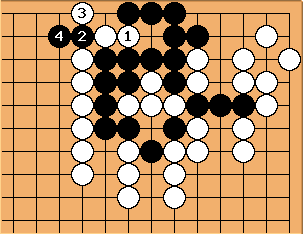 tapir: White has made two bad moves in a row, in your examples (Selfatari and ) - i therefore changed your diagram, but later rechanged it because the discussion would be ununderstable else. Symplicity: The cut works perfectly here. 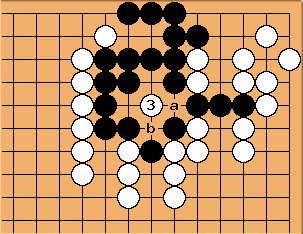 White cannot play at a.
Dave: How about this to create a third possible eye for Black? Now Black can tenuki. Regardless of where White starts, Black can live by playing two of the points marked a, b, c, and d.